Anthony Staatz says Durivo insecticide will change the way he grows his crops for supermarkets. A new crop management system is helping vegetable growers reconcile the consumer demand for first-rate produce with the goal of minimising chemical usage. Durivo is a unique soil-applied insecticide that provides long-lasting protection against grubs, aphids, thrips and so forth in early season vegetable crops. Syngenta , manufacturers of Duirivo insecticide, say a single treatment at planting will protect young plants for up to 40 days and eliminate the need for up to eight conventional foliar or leaf sprays. Because it is applied in only tiny amounts at or before planting, it dramatically reduces spray exposure for workers and delivers benefits for consumers and the environment. 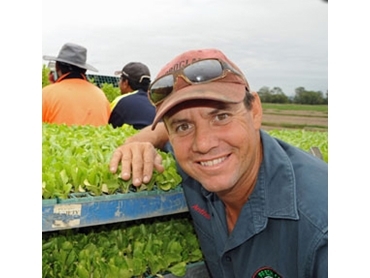 Queensland lettuce grower, Anthony Staatz, says Durivo insecticide will change the way he grows his crops for supermarkets. “We’ll still have to apply fungicide but we’ll get away with a total of just three or four passes over the crop with a boom spray,” he says. Staatz didn’t hesitate when he was offered the opportunity to participate in a preregistration trial with Durivo insecticide last August. He applied the product as a planting hole treatment on 10,000 seedlings. Staatz also sees significant environmental benefits arising from the at-planting application method and the fact that it is applied at a rate of only 0.03mL of Durivo insecticide per plant.